There is a segment of photographers who desire the performance of an interchangeable lens camera, but could do without the bulk from having to carry a body and lens. For that reason, “bridge” cameras were created. They provide DSLR-like attributes, such as different shooting modes and longer lenses than compact cameras, but in all-in-one bodies that are smaller than DSLRs. The problem with many of these bridge cameras is that they use the same technologies found in point-and-shoots, so you weren’t getting any improvements in image quality or performance. Sony changed all that with the advanced RX10-series. Built around a 1-inch sensor and high-quality Zeiss lens, the RX10 has the look and feel of a DSLR, but in a robust all-in-one body that’s weather-sealed. While we wouldn’t compare RX10 models to enthusiast or professional-level DSLR and mirrorless cameras, they aren’t far behind. The latest and best example yet is the Sony Cyber-shot RX10 Mark IV. A follow-up to the already great RX10 Mark III, the RX10 IV has a 25x zoom and Sony’s latest 1-inch “stacked” sensor, but improves upon its predecessor with very fast performance. Admittedly, the $1,700 price tag is tough to swallow, but to get a comparable outfit from a DSLR or mirrorless, you would have to spend much more money. Unlike other cameras we’ve reviewed, we’ve had an opportunity to spend a lot of time playing with the RX10 IV. With such a high asking price, we wanted to make sure this is worth your investment. It isn’t a camera for everybody, but for the right audience, it ticks all the boxes. If you think bridge cameras can’t match higher-end cameras, the RX10 IV will change your mind. Across Sony’s RX10 lineup, the RX10 IV has undergone little in the way of external design changes since the original was released in 2013 (all models are currently for sale). All four RX10 models are bridge cameras with a 1-inch sensor and a fixed, high-quality Zeiss Vario-Sonnar T optical lens, but each offers different features and performance. And, while all-in-one bridge cameras have targeted casual photographers, the RX10 steers toward more advanced users — a fact indicated by its high price. The original RX10 had an 8.3x zoom with a range of 24-200mm and a constant aperture of f/2.8 that’s terrific for blurred backgrounds throughout the entire focal length. The much bigger and bulkier RX10 IV has a 25x zoom (24-600mm) which is extremely useful for zeroing in on faraway subjects. For that extra distance, you have to give up the constant f/2.8 aperture, but f/4 at 600mm is still pretty good. The RX10 IV uses a 20.1-megapixel Exmor RS sensor and a Bionz X image processor. The 1-inch sensor uses Sony’s “stacked” technology that’s designed to deliver faster performance than a typical sensor, as well as features like super-slow-motion. We’ve had a lot of experience using Sony cameras with stacked sensors, and they all deliver solid performance. On paper, the RX10 IV’s specs look like a near-facsimile of the RX10 III, but what the $300 premium gets you is faster performance. Sony told us that the Bionz X in the RX10 IV is actually a newly developed processor, and, working with the stacked sensor, it can achieve a continuous shooting speed as high as 24 frames per second (fps) and an autofocus speed of 0.03 seconds. The RX10 III can shoot up to 14 fps. Another plus is an autofocus system that uses 315 phase detection AF points and 25 contrast detect points that cover almost the entire sensor. Shutter lag is really a thing of the past and you can capture super-fast action. Couple it with an electronic shutter speed of 1/32,000th of second and there isn’t much you can’t grab. The camera measures 5.25 x 3.75 x 5.1 inches and weighs approximately 2.4 pounds (39 ounces) with battery and card, which is a bit heavier than a Canon EOS Rebel T7i DSLR with a kit lens attached. It’s 11 ounces heavier than the original RX10 as well, but remember that you’re getting a higher-quality lens with a long focal range. And speaking of the lens, the non-removable 25x zoom dominates the front. It’s a Zeiss Vario-Sonnar T* lens with 18 elements in 13 groups. 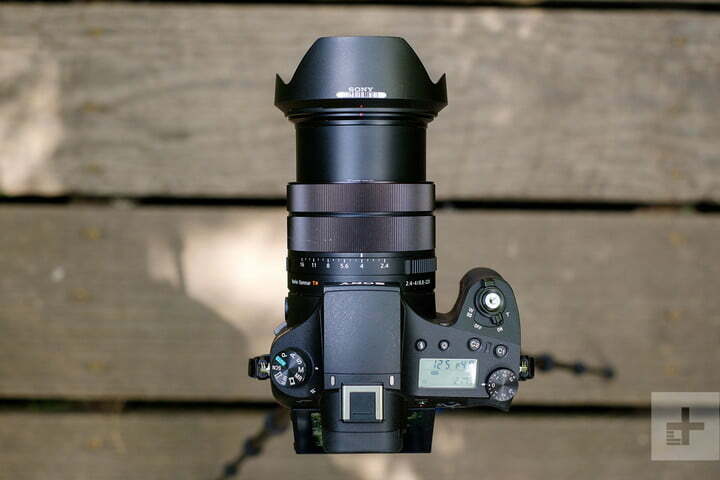 Besides the focus and zoom rings, there’s an aperture ring for when you’re in Aperture Priority mode. A switch lets you change focusing distance to either full, or 3 meters to infinity, but the feature is only effective at 150mm or greater; it’s in full mode otherwise. A Focus Hold button is also nearby, which lets you lock focus, but you can also customize it for another function. On the front there is also a focus control dial, which lets you select either single, continuous, auto, direct manual focus (DMF) and manual focus (MF). During our tests we kept it primarily in auto, as it switches automatically between single and continuous. Besides having a DSLR-like body, the RX10 IV has a small monochrome LCD on the top that shows current settings. This is a feature found in higher-end interchangeable lens cameras, which, again, points to the type of user Sony has in mind. That’s not to say casual users or newbie photographers can’t use this camera, as there are plenty of automatic functions. The rear is dominated by a tilting 3-inch LCD that’s rated 1.44-million pixels. It has some touch capability as well (more on this later), but we have definitely seen better displays. What we do like is the very high-quality 0.39-inch OLED electronic viewfinder with 2.359-million dots. It’s is very good, which is important since you’ll be holding the camera to your eye most times, given the need for stability with a 600mm zoom. On the right side is a card slot while the left doors cover connections for a mic, headphone, HDMI-out port and AV-in port for charging the battery in-camera. Since the RX10 IV is also marketed as a video camera, these ports are ideal. As for battery life the maximum number of shots is 400, which is enough for a day’s shooting but still a fraction of what an enthusiast DSLR can muster — two or three times as much. The RX10 IV supports high-speed SDXC card, and we recommend you use one if you plan to use the advanced shooting modes or 4K video. Like most modern cameras, you can pair the RX10 IV with a smartphone, and use the PlayMemories Mobile app for remote control, or transfer photos for uploading to Instagram or wherever you do your sharing. You can also add location data. It’s nothing special to brag about, but it works. Sony also provides Capture One and Imaging Edge software for processing and editing RAW images. We’ve tested the RX10 IV in multiple occasions, most recently for several weeks capturing the scenery and scenes in Sedona, Arizona and Monterey, California. (Editors’ note: Sony provided us with some of the testing opportunities as part of media events.) For an almost 3-pound camera, it was fairly comfortable walking around with it. When the lens is extended all the way, it looks a bit ridiculous but a little embarrassment isn’t so bad when you can photograph faraway subjects such as wildlife or mountain tops. The 600mm zoom is a boon for wildlife photographers, however, a monopod should be part of your setup. 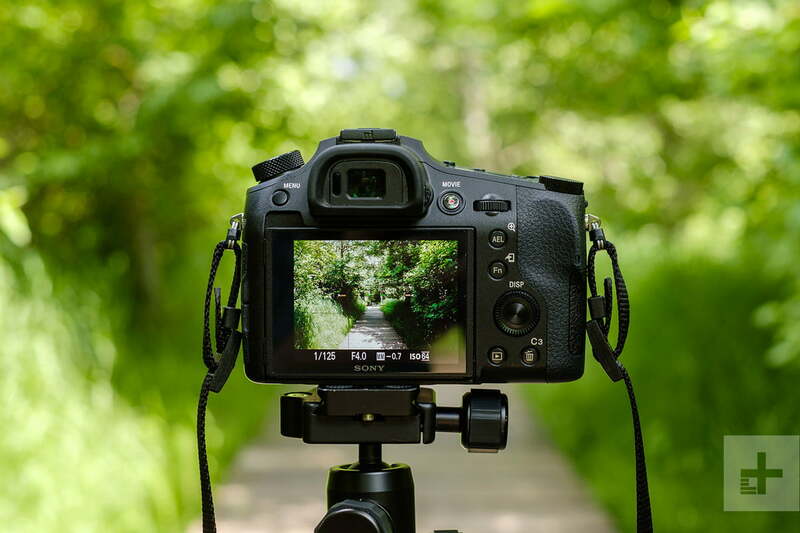 Even though the lens has built-in optical image stabilization it isn’t a miracle worker at 25x zoom since every jiggle of handheld shooting can impact the image or video. We got loads of keepers but we recommend using some sort of support. One of our favorite RX10 features is Eye AF. You frame your subject with face detection enabled, then press the center OK key on the back. A small box appears on the person’s eye; the camera does the rest when you press shutter. What you end up with are portraits that are simply out of this world, with detail so fine you can count eyelashes. Although many rave about other Sony features, Eye AF ranks up there for day-to-day shooting. Dynamic Range Optimization (DRO) is another good but buried feature: Make adjustments (level 1-5) and you can bring detail out of the shadows. We suggest users experiment with these two features. The RX10 IV isn’t just for still photography. It’s the first Cyber-shot model to use Sony’s High-Density Tracking AF technology, which maintains focus around your intended subject, thanks to those 315 focus points. This is ideal for sports or anything that moves, and it’s usually something you see in higher-end cameras. In most instances we shot aperture priority with the single shot setting. In others, such as surfers, we shot 24 fps bursts. The RX10 IV has a mechanical shutter speed of 30-1/2,000th of a second but an electronic shutter hits 1/32,000th. With the proper technique you can capture practically anything that moves. The 24 fps can be lowered to slower options as you drill down into the menus. Although we’ve used Sony cameras for years, the menu system is still dense and we hope it’s revamped in the future. We’ve been asking for years, so wishful thinking, but we are not alone with this complaint — Sony keeps saying they are listening but only time will tell. The RX10 IV has an ISO range of 100-12,800 in auto mode but can be extended to 64 and 25,600. The camera is solid to 2,500 ISO, but then tends to soften a bit as you boost the sensitivity. Even so, 12,800 was useable, which is pretty incredible for a 1-inch sensor. For maximum overall sharpness, we’d try to keep it below 2,000, but in low-light situations, you can definitely crank it up a little higher and still get decent results. Skin tones were right on the money, skies had the right shades of blue, greens were rich. The camera shoots 4K video and we had a ball recording everything from surfers to live rock bands. Again, despite onboard image stabilization, you need proper support to eliminate shake, which is accentuated by the high resolution. In addition to Full HD 1080p, you can also record High Frame Rate (HFR) clips, also known as slow-motion. When capturing a soccer player, at 960 fps, we could see his graceful movement in kicking the ball — layer some beautiful instrumental music in post-edit, and you have yourself an elegant sports movie. When used judiciously this is a fun, creative tool. Just note that you should use a high-speed SDXC card. As with the previous RX10, overall image quality is quite good and appealing. Skin tones were right on the money, skies had the right shades of blue, greens were rich; the 1-inch sensor delivered accurate colors that will make most shutterbugs happy with the end results. Shooting 4K videos with the RX10 is a blast although we did tend to go a little zoom crazy, but if you have a 25x lens it’s hard not to. Just be sure to have a tripod for support in extreme telephoto as every jiggle shows up on the big screen. We found little evidence of rolling shutter in our videos. Color accuracy — just as in most instances of the stills — was on target, with solid results. For those who want to beyond the capabilities of the camera there are mic and headphone inputs for added accessories. We definitely put the camera through its paces and never got close to draining the battery. Still, a spare would be a good thing if you’ll be away from an outlet most of the day. As an all-in-one camera, the Sony RX10 Mark IV is leading the pack. With a focal range of 24-600mm, you’re pretty much covered in most instances — no need to swap lenses. It’s also very fast, thanks to the technologies Sony packed into it. While you can’t compare it to larger sensors, the 1-inch stacked Exmor R is no slouch, especially when compared to the much smaller sensors found in most bridge cameras. Still, at times, the RX10 IV had us wondering why we were still using our big DSLRs. Particularly for landscape photography, the RX10 IV will give DSLRs and mirrorless cameras a run for their money. It doesn’t hold up quite as well for portraiture, with the inherently deeper depth of field of the smaller 1-inch sensor, but it is at least possible to get some soft backgrounds when shooting near the telephoto end of the zoom range. Of course, this is no different than on the RX10 III, which uses the same sensor and lens. Depending on what you like to shoot, it’s up to you to decide if the extra cost is worth it for the speedier performance. There really are no other cameras like the RX10s, and the RX10 IV is the current king of the series. But not everyone needs all the features, and if that’s you, consider the Panasonic FZ2500 ($999). It has a 20.1-megapixel 1-inch sensor, 20x zoom (24-480mm, f/2.8-4.5) lens, and 4K video. It is probably the closest and best competitor, but it doesn’t have the speed. There’s also Canon’s PowerShot G3 X ($899). It has a similar zoom range and resolution, but burst mode is a lot slower (5.9 fps), does not have an EVF, or capture 4K or slow-motion video. Of course, you cannot forget about the previous RX10 models, which are still for sale. The original can be had for less than $1,000, but you won’t get the most up-to-date specs. The RX10 III is essentially the same camera but minus the speed (14 fps, however, is not too shabby), and will save you at least $300. For many, the RX10 III may be the better option. Sony typically updates the RX10 series every 12-18 months. Since the RX10 IV was introduced in October 2017, it should remain at the top of the heap for a while longer, but Sony has a reputation for throwing curveballs. Keep your eyes out for any price drops at retail, a sure sign a new model is on the way. As a camera, it is well-made and very much a premium product; it should last you years, but unlike an interchangeable lens camera, it’s not upgradeable. The RX10 Mark IV is a very capable camera, but it is expensive at $1,700, so it isn’t for everybody. It really depends on your needs, and while it earns our Editors’ Choice, we wouldn’t recommend it to casual photographers who wouldn’t use features beyond automatic or default, especially if you have a limited budget. Even if you’re looking to improve your photography, there are less expensive options. But if you’re looking for an all-in-one that gives you DSLR/mirrorless-like quality photos and videos, and money isn’t an issue, this camera is terrific. Wildlife photographers and travelers should seriously consider the Mark IV — and leave all the bulky gear behind.